Nothing beats homemade chicken noodle soup. My version of the ultimate feel-good food is full of vegetables like mushrooms, onion, carrots and celery. It is easy and makes the best soup you have ever tasted. 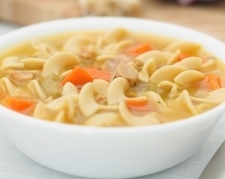 Boiling chicken is the key to this recipe for chicken noodle soup. You may also use legs, breasts, thighs, but leave the skin on to make the broth delicious. My homemade chicken soup recipe is the same, except I don't use noodles. I usually do not put noodles in the soup anyway because they soak up all the broth - especially if it sits for a little while.